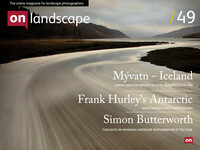 Surrey Photographer who's had a life long love affair with the British landscape, mountains and water. I wonder how many of you carry out any sort of backup to your images? Well if you do and you're confident that your images are safe then I guess you need read no more, you can move on to another excellent article from this edition, if however you don't backup your image files then I strongly suggest you read on. I guess talk of backups and administration can appear boring to some, or avoided because its complicated and difficult, well yes it is perhaps a bit boring, but does not have to be complicated or hard. If you choose the right tools and manage things then it can be much easier that you think. So let me start by making one thing clear from the outset, the Hard drive in your computer is a mechanical device, it has high speed spinning disks, motors and servos, and delicate heads that move about collecting your data and one day it WILL FAIL! Yes you read that right, I can say that with certainty. However you may upgrade your computer well before that happens and the drive may be someone elses problem or it will be scrapped long before it will fail, but it you kept it in use for long enough it would fail. I know that Hard Drives are really very reliable these days but are you willing to take a gamble with your valuable images. So now you have digested that scary bit of information what can we do to protect ourselves from loss. Well as you would expect there are many ways of protecting our images from the pretty cheap to the very expensive and for this article I want to talk about the cheap to middle end, the sort of thing that most of us can afford to implement. Now to start with Its best that you get a bit organised and keep your image files in a structured layout. In my case I keep them in a main folder called ‘Image Files’ , I then have subfolders of this called ‘Canon Raw Files’ & ‘Photoshop Work’ etc. Doing it this way means I find it easier to find what I want and it makes the backup procedure much easier. So starting with the cheap option, you can just burn a copy of all your image files to recordable DVD’s and keep adding to each DVD as you take new photographs and start a new DVD when it gets full. Now this is better than not doing anything but it is not the best way of doing things as its quite difficult to manage and it gets complicated to keep track of changes and edits you may make to a file, but if all you want is a copy of the original RAW (or JPG) file then it works and its pretty cheap. I would however recommend burning the same data to two DVD’s thus having a duplicate DVD, as DVD discs can also fail or develop read errors. The next option is online backup solutions, there are many of these to choose from and as I don't use any I am not going to make any recommendations but they all work along the same lines. They can however be quite costly as the free size limits can be quite small especially in relation to the amount of gigabytes image files can consume, so you will normally need to pay a monthly or yearly fee for more capacity. They usually come with software of some sort to manage what data is transferred and how often etc. This will normally run in the background so once setup you don't need to do anything. These options can be good and your data is stored well away from your computer so your data is still safe even if you have a fire or burglary but can get expensive if you need lots of capacity and if you don't have access to fast broadband the upload times can be painful. Also bear in mind that if your loose your main Hard Drive you will need to get a working Drive with operating system installed and drivers for internet access before you can get to your data. Finally, you are entrusting your data to a third party that could disappear overnight taking your data with them, so if you go this route do some research and pick a reputable company. The final option is to do backups yourself to an external hard drive and there are many bits of software out there for this. The final option is to do backups yourself to an external hard drive and there are many bits of software out there for this. I backup my main computer drive to an external drive with an application called Image for DOS, this is fairly easy to use I just boot my PC to a Image for DOS CD (which the software creates for you) and run the backup from there, it is also easy to restore the whole PC to a new drive should your main one fail. I have tested this and it worked fine. Now if you had a large drive in you PC and can keep all your image files there and used Image for Dos every week then this might be all you need to do but it can take a few hours to backup (depending on how much data you have) but if you leave it to run overnight that that should not be a problem. You can also use a file sync program, I use one called GoodSync. This allows you to set up Jobs that monitor folders on your PC and when changes are made or new files appear it will automatically copy them to another drive or USB memory stick, these jobs can be set to run on a schedule or on startup or close down or when changes are made. I use this in addition to the full backup so as I make changes to files or copy new ones from my camera Goodsync just backs up these changes without any thought or intervention on my part. This fills in the gap between the backups I take and hopefully means I won't lose anything. File Sync programs like Goodsync if used alone will not make a fully recoverable backup of your system but are a good way to automatically backup your data. You can go as far as to keep the external drive at a friends house to add to your file safety but it depends on how bad it would be for you if you lost all your images is say a fire or a burglary. So what do I do, well as I said I take a weekly full backup of my main computer drive with Image for Dos to an external Drive and in between backups I use GoodSync to cover new or changed Image files (as well as other important data) to another external drive. I don't go as far as keeping these backups off site but every so often I copy new RAW files to recordable DVD(s) and keep those off site at a friends so if all else fails I know I would have a copy of most of my original RAW files to go back to. Its difficult to be 100% covered but it does not take too much effort to be reasonably well protected. I know there are other methods of protecting your data and I know there are many applications and lumps of hardware to achieve it and its impossible to cover all the options but I hope if you presently don't do anything to protect your data, you will go and look into options that suit you and your budget and do something about it. After all just have a pause and think about the effect of losing all those images!